BORN INTO A PAINTER’S WORLD, PHOTOGRAPHY NATURALLY INHERITED THAT DISCIPLINE’S BIAS TOWARD SHOWING THE WORLD “AS IT IS“, and, in fact, the first fifty years of photographic images seem to be in a neck-and-neck race with painting for the best rendering of the world at large. Then the 20th century kind of dope-slapped humanity’s collective sense of “reality”, as a world war, the onrush of science, and the rise of secular thought combined to question what the hell we needed with reality, anyway. The arts were shaken to their foundations, and photography and painting spiraled off onto wild new side roads. All bets for what defined a “picture” were off. That’s not to say that photography has remained visually unbound through the decades. It almost acts like the flow and ebb of the surf. Photos surge toward pure documentation, then pull back into pure effect. They roll forward into an absolute deconstruction of the real world, then clamber back into the safety of literal pictorialism. One day we’re trying to recreate a wilderness landscape with perfect fidelity; the next day we’re reducing all “subjects” moot, reducing everything to shape and light. I have had to spend many years getting comfortable with abstractions in my photography. It’s not like I don’t have ideas that wander far from the visual mainstream. If anything, I’ve had to learn to trust those visions, to stop worrying about whether they have “value” versus some rigid, if invisible,standard. While some shooters started with an absolutely open attitude toward the camera, pointing, framing and living completely by whim or instinct (the Instagram and Lomo kids of my Stone Age), I was absolutely, unwaveringly serious about arranging or capturing things as I literally saw them. It was a very clenched approach, even if it did teach me the physics of the medium. I had to learn to hold things very tightly before learning to let anything go. And it took a very long time. The great gift of the digital era is that many “accounting” issues (how much film do I have left? where can I go to get these processed? do they sell my kind of film in this end of town?) are just plain gone, and, with them, a little of the constipated approach that they imposed on me. At my age, it no longer matters a damn how long I shoot, how many times I “fail”, or who does or does not choose to anoint the results. There are no teachers or parents left to show off for, no competition with anyone except myself. I am free to use surfaces as straight lines or use distortion as a design element. But ah, my foes, and oh, my friends— It gives a lovely light. This entry was posted on January 24, 2014 by Michael Perkins. 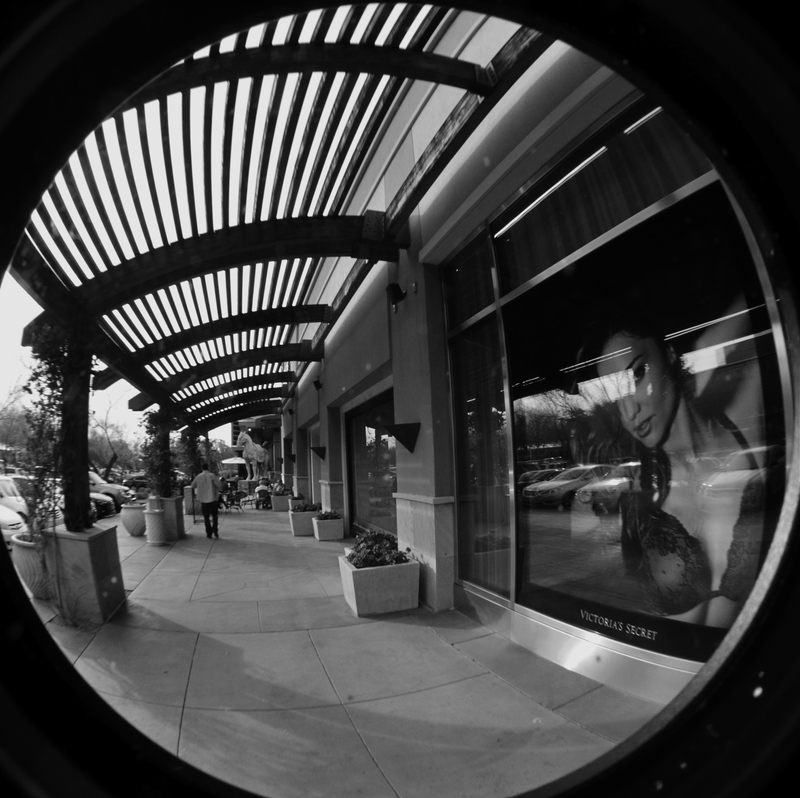 It was filed under Abstract, Composition, Monochrome, Street Photography, Wide-Angle and was tagged with Approach, Fisheye, Monochrome, perspective, Street Photography, Style.